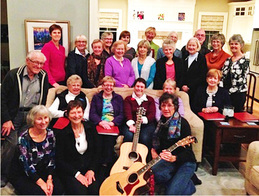 For the past several years, PROBUS Club members have joined together to participate in PROBUS Singers and Friends. This is an informal group for people who like to sing. An ability to sing is not a prerequisite, just an enjoyment of singing. While our group is predominantly PROBUS members, we welcome non-PROBUS individuals as well. Our aim quite simply is to have a good time singing and socializing. Please note that, as the membership includes non-PROBUS participants, this is not considered by Glacier PROBUS to be an Interclub event, for liability purposes. We would be thrilled to have any members of Glacier PROBUS who would like to come out.